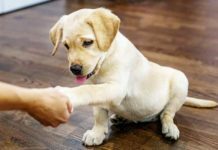 Pippa Mattinson, author of the best-selling dog training book Total Recall, shows you how to teach your puppy or dog to SIT in five easy stages. 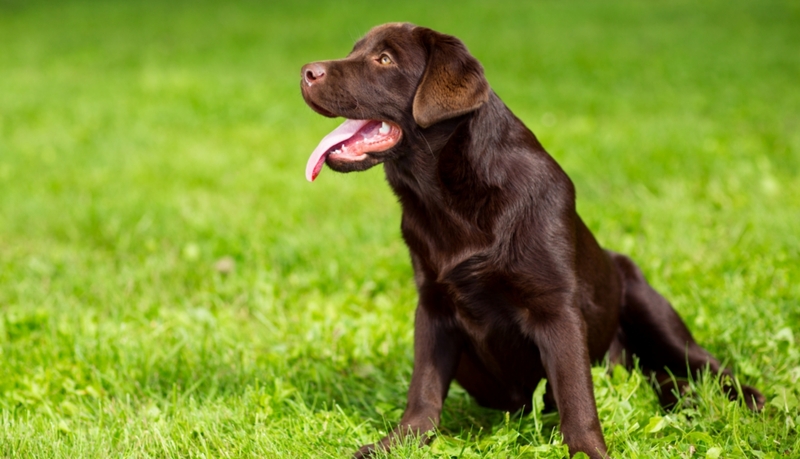 You may be looking for the best method to teach a new Labrador puppy to sit. If so you’ll want a method that is fairly quick and that will be fun to teach. 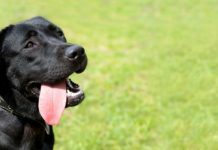 You might want to know why your puppy has stopped responding to the SIT command, or why he only responds when he feels like it, not when you want him too! I’ll be helping you with that. I’ll also be answering your questions about teaching sit and helping you choose the best method to teach your puppy or older Labrador. I’ll show you how to get your dog to obey you when you say SIT – even when he doesn’t really want to. And even when you don’t have a treat to give him. This is a very detailed guide and you’ll want to refer to it again as you work through the training stages. You can use the green menu to easily find your place or skip the bits you’ve already read. What is the best method for teaching sit to an older dog? When I trained my first few dogs, it was standard practice to teach sit by pushing down on a dog’s bottom and pulling up on his collar. At the same time as commanding SIT, SIT, SIT! [wp_ad_camp_5]Once the dog had figured out what SIT meant, he would most likely be given a slap on the rump if he failed to sit quickly! Dogs did eventually learn to sit this way. Usually after plenty of wriggling and squirming. They also learned that people could be mean and unfriendly, and that training can be stressful and upsetting. Fortunately, we now have much better ways to teach sit. Nowadays we teach dogs to SIT in a series of easy structured steps, using a temporary lure, and food rewards, and without entering into any kind of physical tussle with the dog. What is the best way to teach young puppies? [wp_ad_camp_2]With old fashioned methods, we avoided doing much training with puppies. It was too stressful for them. But with modern methods there is no stress involved and you can start training using the methods below, with puppies as young as eight weeks old. Many people find it quite easy to teach their puppy to sit to begin with. Then problems start creeping in. Disobedience – Why does my puppy not sit when I tell him to? Even though he knows exactly what the SIT command means. The reason for this early break down in obedience, is that the owner has not ‘proofed’ their SIT cue. But what does that mean? Many Labradors will not sit if there are other dogs around. Instead they want to rush over and greet the other dogs or play a game. This is another common problem. You go to the trouble of making your dog sit – someone goes to pet him – and up he gets again. This is very frustrating but just as before, it is perfectly normal. You don’t need to worry about it, because in Part Two of this guide I’ll teach you how to proof your dog’s sit so that he carries on sitting still, even while people stroke him or give him a treat. There are two aspects to training a dog to sit. Both these aspects need to be included in any training programme. But think about it. When are you ever going to be in a situation when you just want your dog to touch the ground with his bottom and stand up again straight away? The answer is, you are not. When we tell a dog to sit, we hardly ever want him to get up again immediately. We almost always want him to STAY, even if only for a little while. Imagine how confusing it is for a dog if he doesn’t actually know how long a SIT is meant to last? Is it one second? Three seconds? Ten, twenty – what do you want him to do? The truth is that there is always some kind of a STAY requirement in a SIT, even if its only a short one. STAY is an integral part of SIT and you do need to incorporate duration into your ‘sit’ training from an early stage. Duration, or the length of time you want the dog to hold a sit, is simply another aspect of proofing. You won’t need a separate ’stay’ cue with this method. Your dog will simply stay sitting until you tell him he can go. When you give your signal – SIT – which tells your dog you want his bottom to hit the ground and remain glued there, you want him to respond quickly and without thinking. This kind of automatic unthinking reaction takes a little training and effort, but it is worth it. What you don’t want, is to be in a situation where your dog won’t sit if he has better things to do, or if you don’t happen to have his favourite treat in your hand. You don’t want to be bribing your dog, arguing with him, or pleading with him to get that response. You want it to happen instantly, without hesitation, no matter where you are. For that wonderful state of affairs to occur you are going to need to put on your ‘dog trainers hat’ for a few weeks. You’ll work through each stage at a time, before moving on to the following step. It is all done with rewards, you won’t need to push or pull your dog around, dominate him, boss him or be mean to him. This will be fun! There’s no need to waste any more time chatting. Let’s begin! Choose and protect your SIT cue! Your first job is to choose your cue. I should point out at this point that most modern trainers no longer use the word ‘command’ for the signals they give to get their dogs to do what they want. With a very common cue like SIT it is very important to make sure that your cue is not devalued or poisoned by people around your dog associating that cue with some other actions, such as bum waggling, jumping up, or pulling on the lead. This can easily happen in busy families where a lot of different people are giving the dog instructions without making sure they get the required response. Dogs learn by associating cues with their actions. So if your Granny is forever telling your dog to SIT when he has his paws on her shoulders, he will soon come to believe SIT means – “put my paws on your shoulders” SIT is then a poisoned cue – in other words, it has lost its meaning and gained a new and undesirable one. 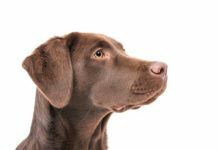 For this reason, if your dog has a long history of disobeying the SIT cue, or if you have relatives that constantly give your dog instructions, I recommend you choose a NEW cue (and keep it to yourself). I use the word HUP as my sit cue, but any short clear word will do. Making SIT a fun thing to do – Stage 1 Get it! Dog training should be fun. For both of you. Your dog should look forward to training sessions, he should be excited to see you getting your equipment ready and keen to get started. This is partly what Stage One is all about. It is also all about getting a new behaviour established. For some cues this is a quite an involved process. But for the SIT cue it couldn’t be simpler. All dogs sit quite naturally. Your job is to make your dog aware that you like it when he ‘sits’ and that if he sits and looks at you, he is likely to earn himself a treat. This is not about ‘teaching’ this is about making SIT fun. You won’t be TELLING your dog to SIT. In fact the only word you’ll be saying is YES! I’ll explain more in a moment. But for now, it is really important at Stage One that you don’t say the word SIT or give any other sit cue. This is about getting your dog to CHOOSE to offer you sit after sit. It’s about building his enthusiasm for showing you how quickly and how nicely he can sit. I think it is important to keep a clear distinction in your mind between food rewards, and a food lure. Food rewards are given to the dog when he has completed an action that you want to ‘reinforce’. In other words, that you want him to repeat again in the future. You will need lots of tiny (pea sized) chunks of tasty food for each training session. A food lure is a temporary aid that enables us to move a dog into a position without pushing and shoving him around. A lure should never be used repeatedly – as a rough guide, try never to lure more than two or three times in a row. Otherwise the dog will become dependent on the lure. Long term use of a lure is just bribing. And we want to train, not bribe, our dogs. 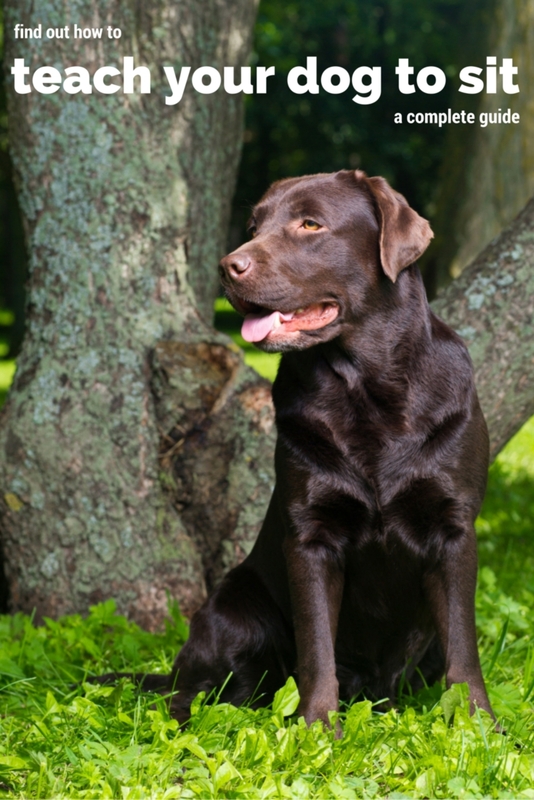 To keep the distinction between lure and reward clear, it can be helpful to avoid feeding the lure to the dog. Lure with one hand, then feed/reward with the other. Rewards don’t have to be food. They can also be toys or opportunities. BUT, I caution you against avoiding food at this early stage in training. Food is quick to deliver and consume. A dog can swallow a treat in the blink of an eye. Once you start rewarding the dog with a game or a toy, you are then committed to lengthy interruptions throughout your training session. You also have to get the toy back from the dog before you can ask for another repetition. We want to train quickly here. You will lose the flow of your training, and interrupt the dog’s concentration and learning process if you keep stopping your training session for a game. Stick to food at this point. Toys and games will come later. The food you choose must be valuable to the dog. Some dogs will work hard for kibble, others, not so much. Remember that in dog training, higher value rewards can get you through more challenging tasks. Always be willing to raise the value of your reward in order to get a new behaviour started or to overcome some obstacle. It isn’t cheating, it’s common sense, and you can fade out the high value rewards later. To begin with, you can have your training treats in a pot on a handy table or worktop. But you don’t just want your dog to SIT in your kitchen. You want him to SIT in lots of different locations. 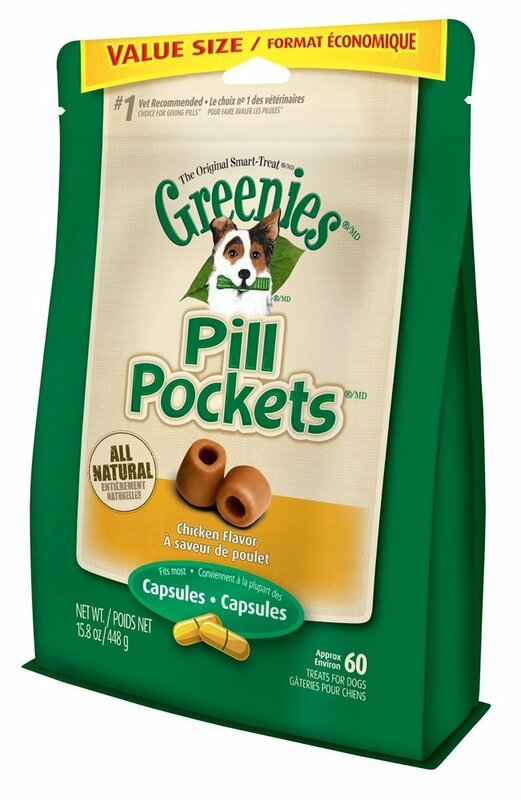 Once you begin training in those locations you are going to need a portable treat bag. So you may as well go ahead and get one right now. This is mine. It clips easily onto a belt loop and has a nice wide opening that stays open. It also sits nicely in a roomy coat pocket. An event marker is a sound or signal of some sort (for a deaf dog it can be a hand signal or flashing light) that tells the dog he did something you liked. I suggest you use the word YES. You’ll need to say YES clearly, in a really upbeat and enthusiastic way, not in a boring conversational way. And you’ll need to follow this special YES immediately with a treat. Before you start training, read the instructions carefully, especially the information about common mistakes. This will help to make sure you and your dog make steady progress. You need to start in a fairly small indoor space. Your kitchen or hallway might be suitable. The most important point is that the surroundings should be familiar and boring to your dog. You and your pot of treats should be the most interesting thing in the room. Make sure there are no other people, not other dogs, and no disturbing noises going on outside. Don’t try and train while the postman is pushing letters through the door, while the kids are having tea, or whilst the window cleaner is working on the room you are in. Set your dog up to succeed. For many dogs, you don’t need a lure at all. The lure is our ‘back-up’ so that we can keep things flowing quickly. Have your treats ready, and be ready to say YES the moment your dog’s bottom touches the ground. Here are the instructions. 2. As his bottom touches the ground say YES! 3. Throw a treat on the ground, far enough from him that he has to get up to eat it. 3. As his bottom touches the ground say YES! 4. Throw a treat from the other hand, far enough from him that he has to get up and eat it. 5. Repeat once more then open up your empty lure hand, so that the dog can see there is nothing in it, and quickly repeat the same hand movement that you used when luring. 6. Throw a treat from the other hand, far enough from the dog so that he has to get up to eat it. When you have completed Exercise Two, go back to Exercise One, and wait for the dog to offer a sit. Most dogs start offering sits very quickly and won’t need more than one or two repetitions of Exercise Two. The timing of your YES word is important. Don’t worry if you are not great at this to begin with. You’ll get better with practice. Even experts click or say YES at the wrong time occasionally. With SIT, it is better to mark a fraction too early than a bit too late. That way you capture the ‘intention’ of the dog to sit (as his bottom goes down) rather then intention to get up again. Don’t lure the dog into a sit more than two or three times in a row. Show the dog your hand is empty then rapidly repeat the luring action with your empty hand. If you do this immediately after luring two or three times, the dog will follow your empty hand – even though there is no food lure there. You may need to lure occasionally in between empty hand lures, in the early stages if your dog seems confused. Are you telling your dog to SIT? DONT tell your dog to sit. Don’t give him instructions. What you want is for the dog to figure out for himself that SITs are what gets him a reward. So don’t be tempted to do it. We want him to be enthusiastic about SITs. This enthusiasm will help you in the next stage when you teach him what the word for this action is. Dogs love this type of training. It is a brilliant game that gives them control over something that they want, and we all love to be able to control the flow of desirable experiences. If you use boring food – dried up biscuits for example, your dog may not enjoy the game as much, and you will make slower progress. The worst thing you can do is to try to replace food with praise or petting. Experiments have shown that praise alone is completely ineffective in changing behaviour in domestic dogs. If you do this, you will not be as effective as people that use food. It also makes sense not to train your dog just after he has consumed a large meal. Your training treats will seem more valuable if your dog has an appetite. But duration in dog training is a form of distraction or complexity. It complicates things. For that reason I suggest you don’t ask your dog for much longer sits at this point. We’ll look at those in Teaching Your Dog to Stay. Take every opportunity to ‘capture’ sits. Be patient – just stand and look at your dog for a moment or two. Once this process is underway the dog will start to ‘offer’ you sit after sit in order to earn a reward. This is the point you want to get to, and it won’t take very many sessions for you to reach it. 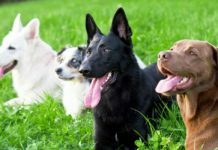 If your dog is offering you lots of sits each time you start training, and it you have had at least three training sessions spread over at least two days, then you can move on to Stage Two. Understanding the meaning of SIT Stage Two – Pair It! This is a language lesson, not an obedience lesson. Have food lure ready. 1. Observe your dog and as he starts to lower his bottom to the ground say SIT. 3. Throw a treat far enough from the dog that he has to get up in order to reach it. The reason you need your lure handy is that you will almost certainly make the second of these two mistakes at some point. So have your lure handy. Sometimes, the fact that you have spoken to him will distract the dog and he will change his mind half way to the ground, and stand up instead. In this case you must immediately lure him into a sit, then mark, and reward, that sit. Next time, say your SIT word more quietly and calmly so as not to interrupt the ‘flow’ of his sit. Sometimes, you will make a mistake and say SIT when your dog was not actually going to sit. Your response should be the same as above. It will take you a few days to get to this point in training. The point where you have a dog that just LOVES to offer SITS and where the SIT cue is firmly associated in your dog’s mind with the action of sitting. Instructions for SIT training Stage Three – Teach It! In this stage of training, we will be teaching the dog to respond to our cue. This means that when you say SIT, your dog will plonk his bottom on the ground. He won’t stand there wagging his tail, or roll on his back, he will sit. Like the good dog he is. We are looking for that automatic response where the dog doesn’t have to think about what he is doing. He just hears the word SIT and automatically SITS in response. You have laid the groundwork for this, and if your dog is just standing still looking at you and you say the word SIT at this point, he will almost certainly SIT. 1. Observe your dog and while he is standing up say SIT. 5. If at any point he fails to sit lure him into a sit and reward as before. What if the dog sits before I tell him? Sometimes the dog is so keen and enthusiastic to sit, that it is hard to get him to stand up. If your dog often fails to sit on cue, and you have to lure a sit more than once in every ten or twenty sits, you probably need to go back to Exercise 3 for a few days. Most dogs have no problem at all with this fourth exercise. But there is a bit more work to do yet. 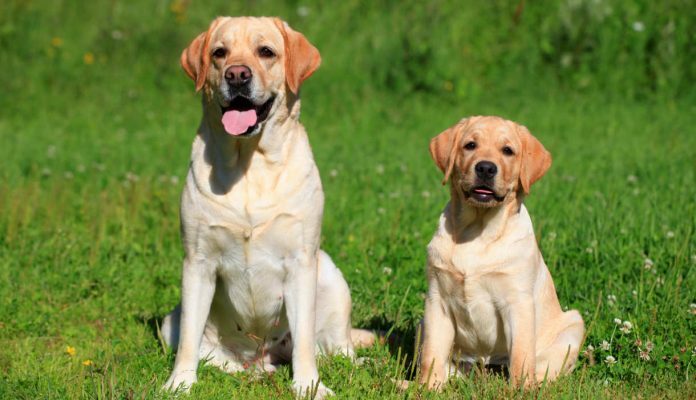 To begin with, and especially if SIT is the first thing you have taught your dog, he will SIT often in training sessions because of the context rather than because he truly understands that SIT means SIT rather than DOWN or GO TO BED or SPEAK or any other command you may have taught him to respond to. You can test this by setting up your training session, looking at the dog, and giving him a completely different cue, such as DOWN. You’ll probably find he will SIT. In fact, if you look at him and say BISCUIT or TREE, he will also probably SIT. He is relying on the context of training + treats+ location to assume what you want. So does this mean you have failed? You haven’t taught your dog to sit at all? [wp_ad_camp_1]No, it doesn’t. But it does mean that your dog needs to learn to discriminate between two separate cues and not just rely on the context of the situation to ‘guess’ what you want him to do. This is why it is quite useful to train pairs of behaviours. 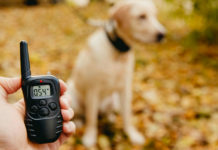 If for example, you have taught your dog to lie down, or to stand, you can alternate these cues now, making sure he responds correctly to each one. To do this, give the same cue (SIT for example) several times in a row – luring if he makes an error – until he responds correctly repeatedly. Then switch to your second cue (DOWN for example), and do the same with that. Once he is getting the second cue right every time, switch back to the first one again. If you have already introduced the stand cue, then alternate these two instead. Gradually, over the space of two or three sessions, you will be able to switch from one cue to another with fewer repetitions. Until you can give just one SIT cue followed by one DOWN cue for example, and the dog will respond correctly. No matter what order you give your cues in. Learning to STAY Stage 4 Proof It! In stage four we take quite a leap in the training programme, so it’s important to break it down into achievable steps. Stage four is all about proofing the nice smart response your dog gives to your cue – and proofing means making sure that the dog will obey you in all kinds of different locations and under all kinds of different circumstances. Once we have some duration, we’ll be adding distractions and distance. Once you have finished you’ll have a dog who will sit and stay for several minutes, in all kinds of different places, even if you walk away from him and go out of his sight. 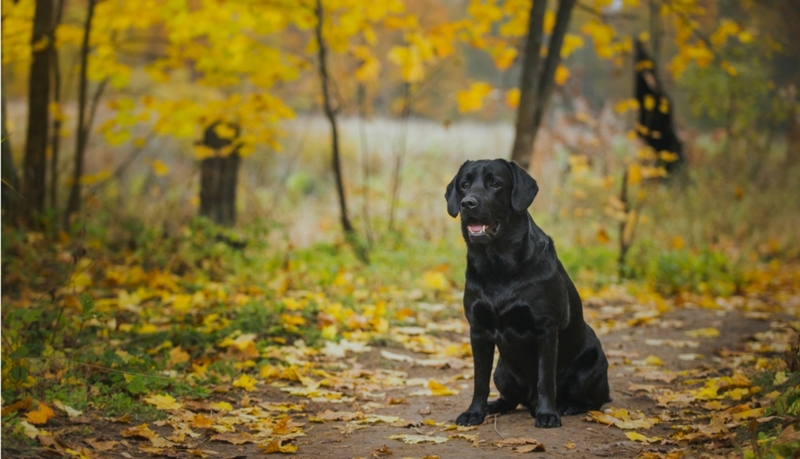 You can find out more about Training your Labrador in the Training section of this site. 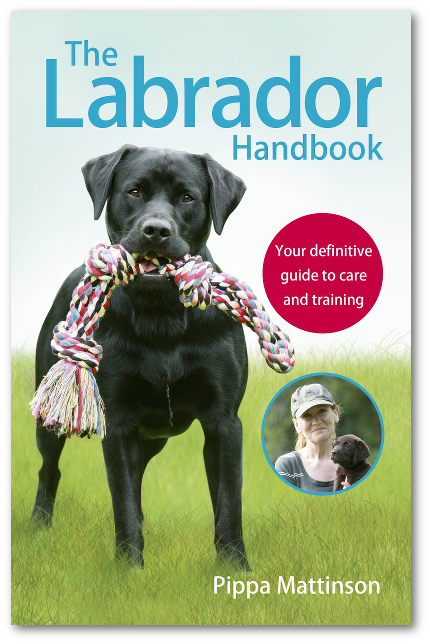 If you’d like all of our Labrador information together in one place, then get your copy of The Labrador Handbook today. 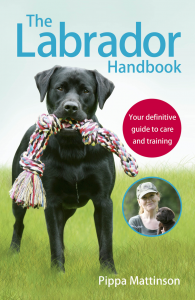 The Labrador Handbook looks at all aspects of your Labradors life, through daily care and training at each stage of their life. Wow, what an in-depth article on teaching a dog to sit. Thanks for sharing. I know understand why my dog does not want to sit at times. And like what you mentioned, it is better to combine the Sit and Stay command together. Hi, great article. My “Cherry” is nearly 2 months old now. Had the first ever two sessions with her today. She was giving me sits fairly quickly. Followed me a bit once I called her and then immediately sat down and looked at me for a treat. I want to understand the importance of the “lure hand” as you’ve mentioned it. Will be MUCH OBLIGED to have you reply. your tips are very helpful! I really appreciate them! I’m currently in Stage 1 with a fairly responsive 4-month puppy that has been with me for a little over a week. After one session in Stage 1, he’s already offering me sits all the time and I am worried I’m giving him too much food as rewards. Is it possible to just pet him when he offers me sits out of trainings and leave food rewards for trainings? Thank you so much for your wonderful site! I’m so excited because I’m bringing a four-month old shelter chocolate lab home tomorrow. He is such a wonderful dog, and I’m a nervous new Dad because I want to make sure everything is right for him. The shelter people didn’t know his back story, but he had gotten there the very same day that I arrived, so I’m glad he’s not going to be there that long. Hi pippa ! I have two labs. They are 2 months old. I’m training them separately. One male and one female. The female although has learned the sit and stay command but just chooses not to listen to me in the presence of the male. Although he listens and follows every time. Any tips on how to change the way I’m training her ? Hi Ashley, which part of the training have you got stuck on? I have an 8 week old black labrador who we purchased at 6 weeks. I’m 15 and she has started to only listen to me, I’m training her to sit/stay and not bite but my sister is reversing this training. Any tips on how to get her to listen to other people or is it best for her to listen to me? #how many times in a day? Hi, Pippa I want to ask you what should I use as treat during training my lab puppy ? I have had my lab puppy 3 weeks now – I got him at 7 weeks. The last couple of days – his biting has become unbearable, he actually lunges and snaps!! you can hear his jaws snapping together. Ive tried giving him toys – sometimes hes ok with them and other times not. How long will this last?